According to the new issue of the Blessed Alexandrina Society Bulletin, Sheila Reynolds, wife of the late Francis Reynolds RIP who founded the Irish-based Alexandrina Society, is leaving Ireland and is retiring to Wales. Mrs Ursula Coppinger will be taking over the Alexandrina Society in Ireland. It is that important time of year again, Alexandrina’s birthday. 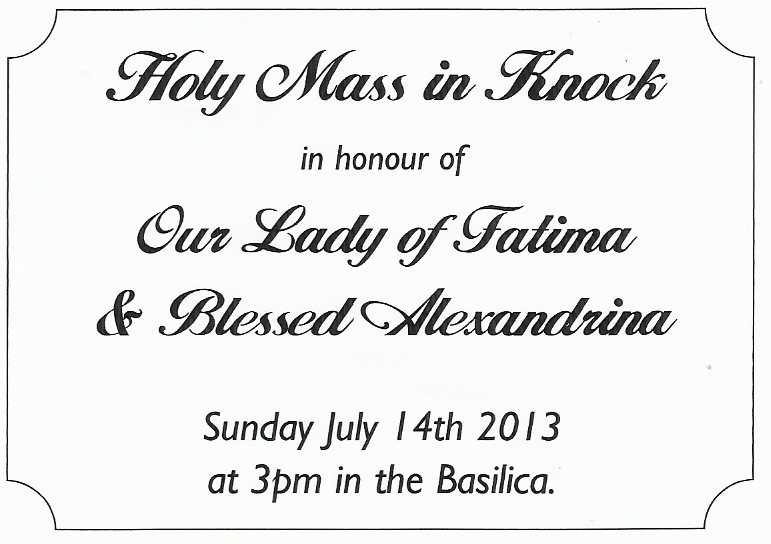 It I a great time for us all to pray together to Blessed Alexandrina, begging for her intercession for all our intentions. It will be a fitting birthday present to her if we could have a 24 hour prayer from 12 midnight on Friday 29th until 12 midnight on the 30th. So please try your best to offer as hour or 30 minutes to her on the day. We've received the new book by Eugenia Signorile on Blessed Alexandrina Il Nascere e l'Evolversi de un'Anima Vittima, "The birth and the evolution of a Victim Soul". There is now a lot of information in English on the new Official Website of Bld Alexandrina. See here. There is also information in Portuguese and Italian. We received a summary of the booklet by Kevin Rowles on Blessed Alexandrina, in the Dutch language.